Take The Escapist's Psychonauts Quiz Now! You don't need to be a psychic to take this quiz, but it might help. This week's issue of The Escapist's weekly magazine is all about psychics in the world of videogames. Fittingly enough, we looked into our tea leaves and saw a message telling us to do a quiz about one of the most famous psychic-oriented videogames of all time. 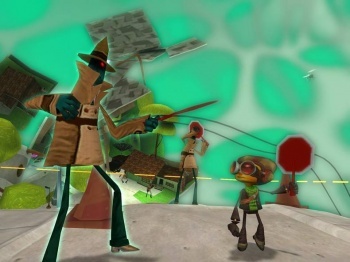 Tim Schafer's 2005 platformer Psychonauts is a beloved cult classic, known as much for its brilliant script and quirky level design as it is for its frustrating platforming. It never sold quite as well as its fans would have hoped, unfortunately, and the oddball adventures of psychic-in-training Raz ended up relegated to lists of "Best Games You've Never Played." So, in honor of the game, let's celebrate it with a quiz! As always, you can take the quiz as many times as you want in search of a perfect score, but it'll be reflected on our leaderboards. Polish up your crystal balls and good luck! You can take the quiz here!